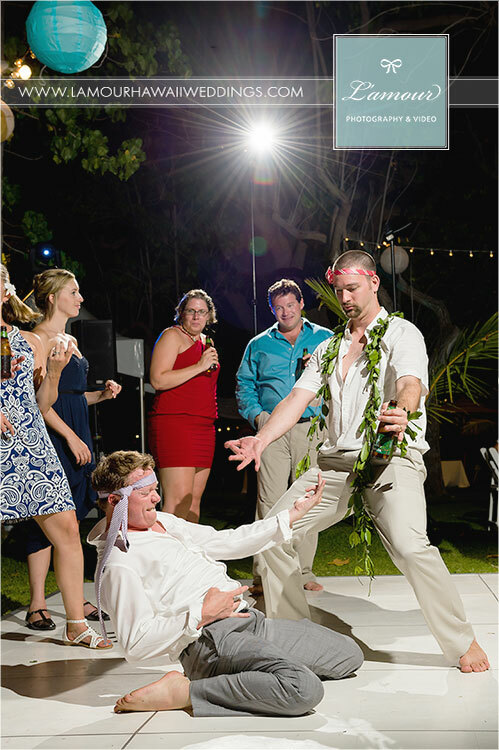 What can I say. 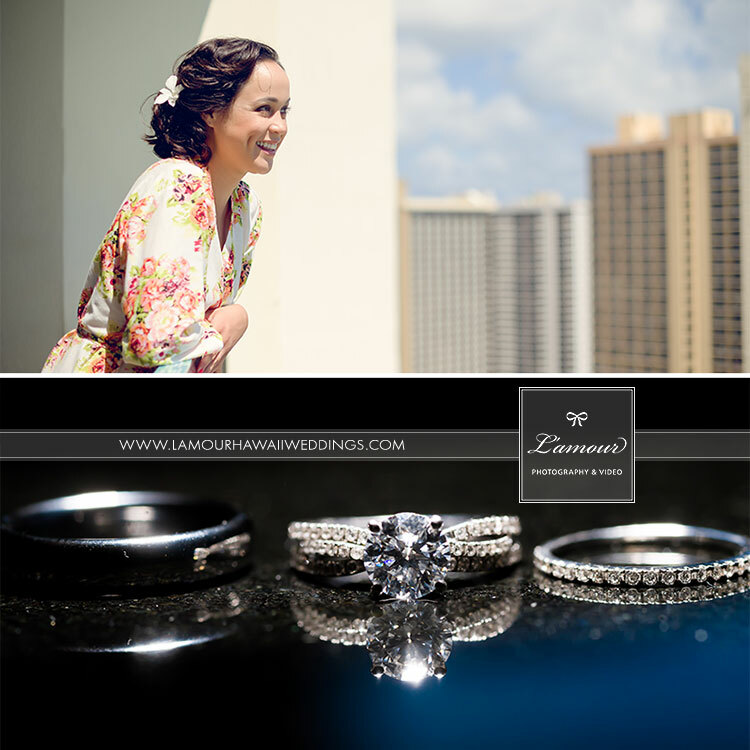 Our team has been pretty busy for such a long time, we have so many weddings to blog about! 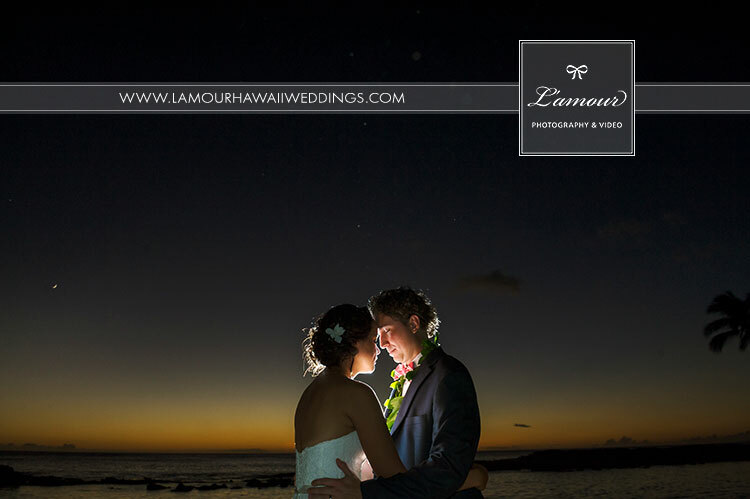 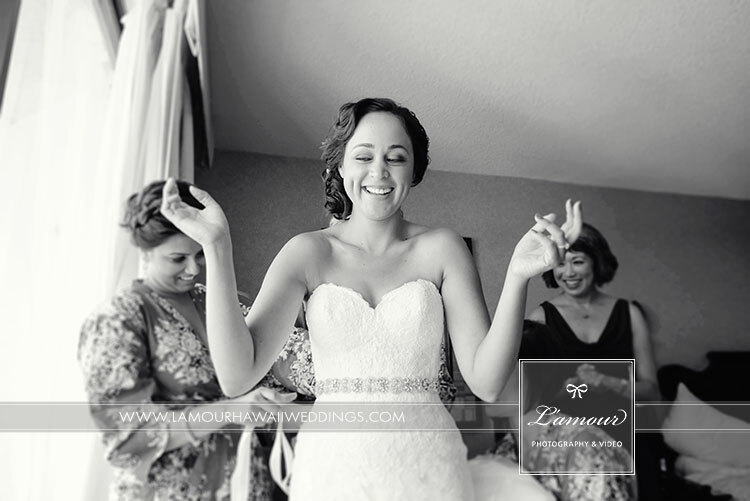 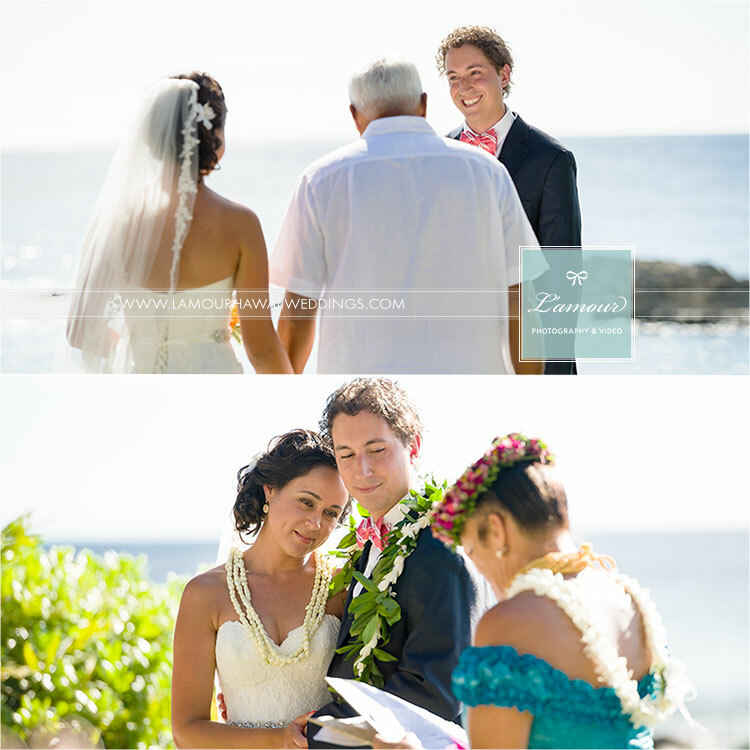 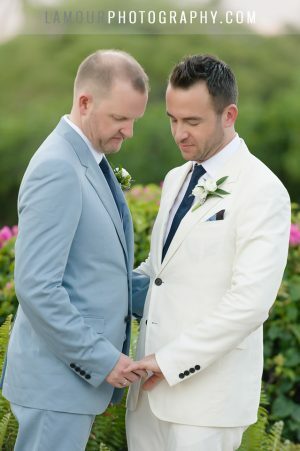 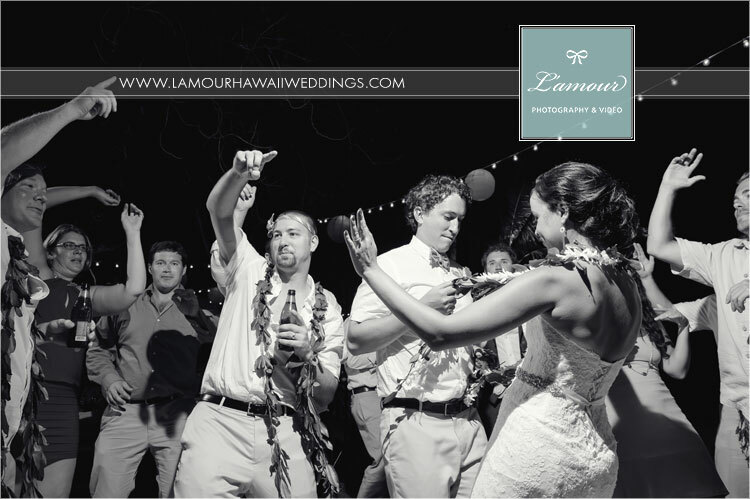 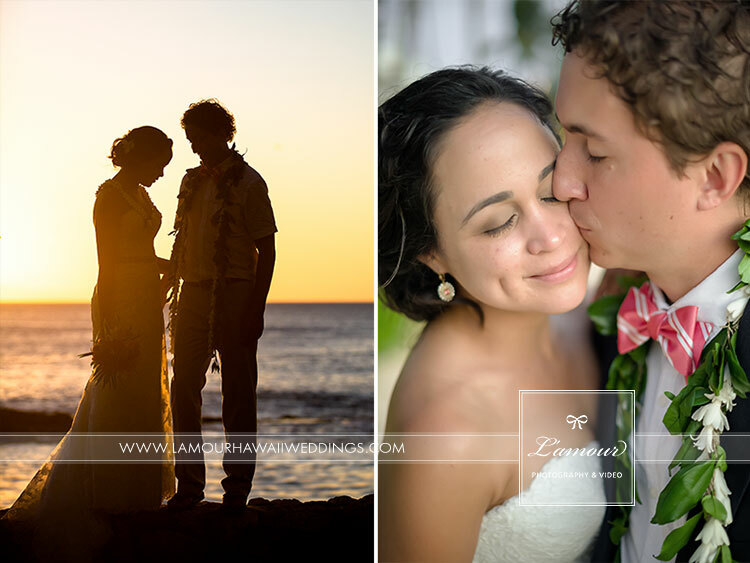 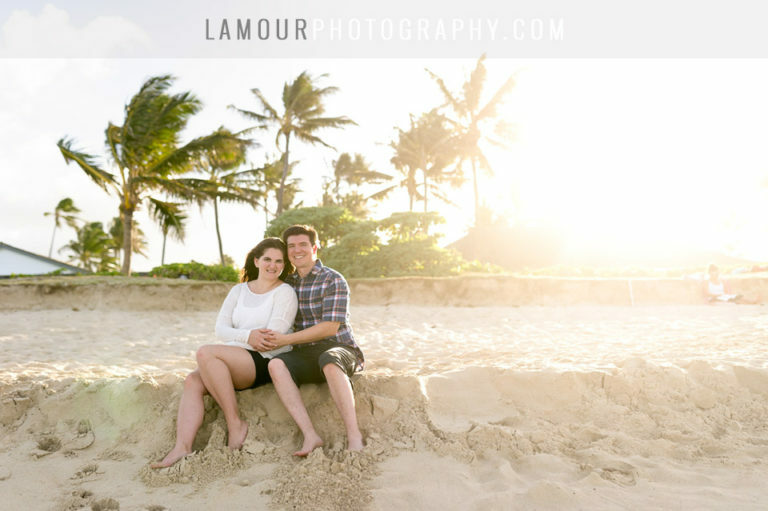 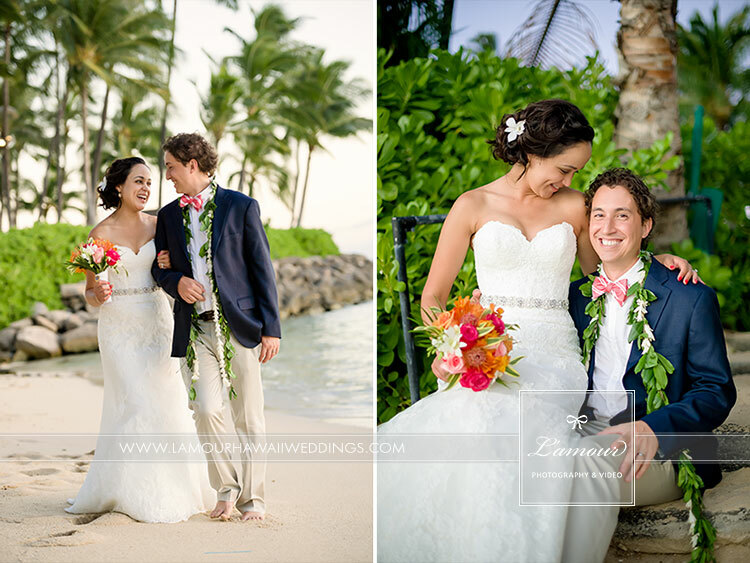 We are very excited to be back and blogging about our many wonderful couples’ weddings in Hawaii! 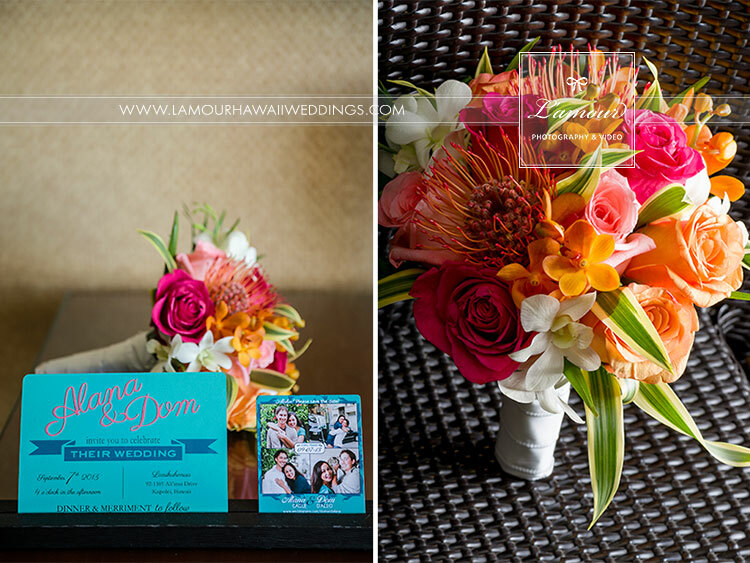 This featured wedding was a gorgeous tropical themed wedding with wedding colors of coral and teal held at the stunning West Oahu wedding venue of Lanikuhonua. 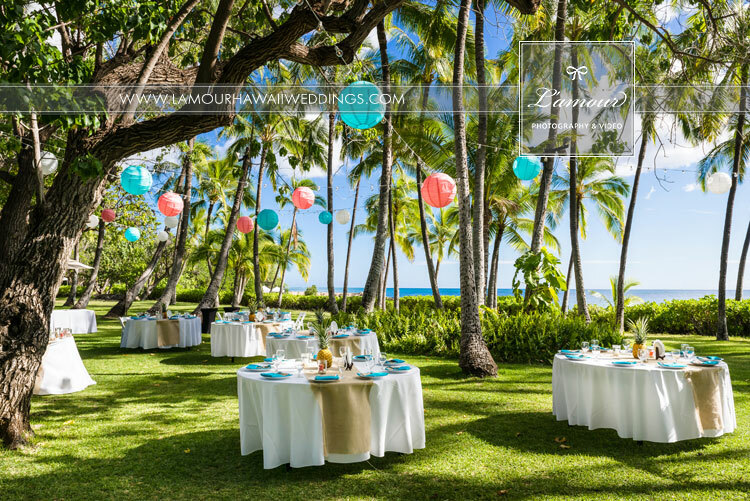 Seahorses, starfish, shells, Hawaiian patterns and waves were used throughout the wedding invitations, ceremony chair decor, reception tables and centerpieces. 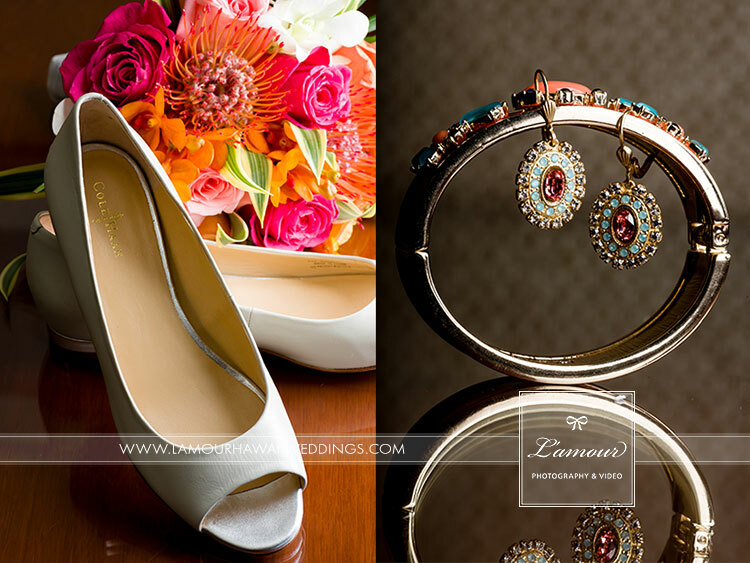 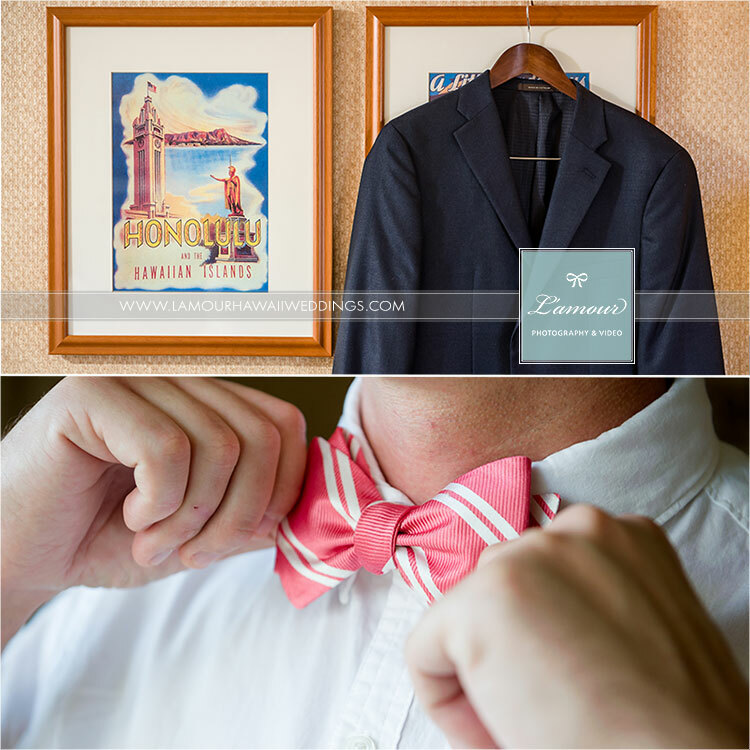 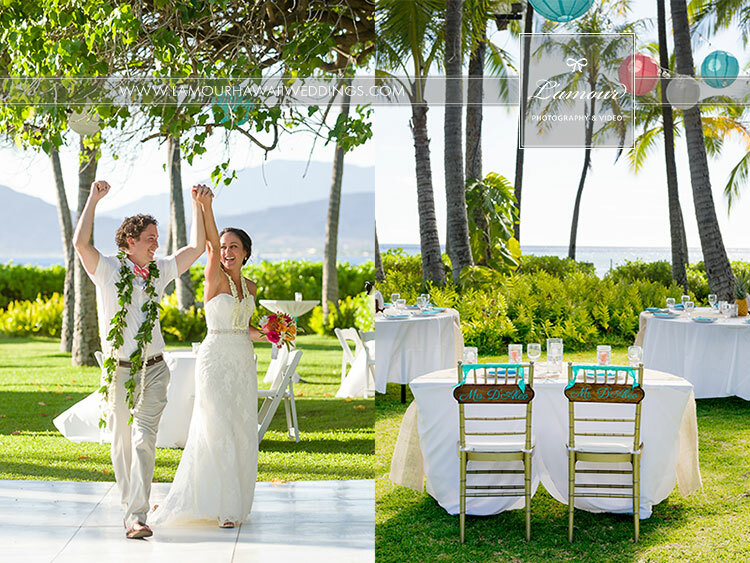 We hope you all enjoy these gorgeous Oahu wedding details and the super cute bride and groom as much as we did! 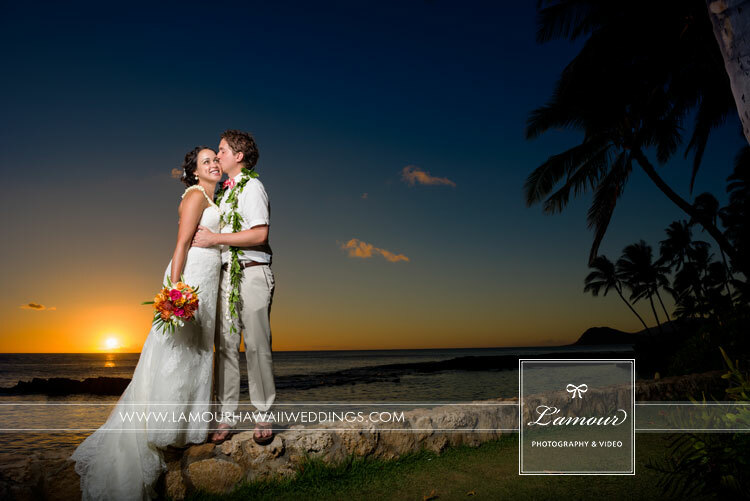 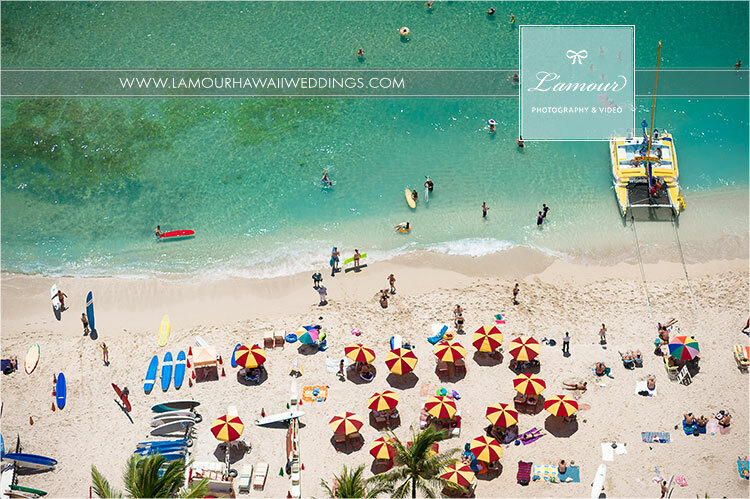 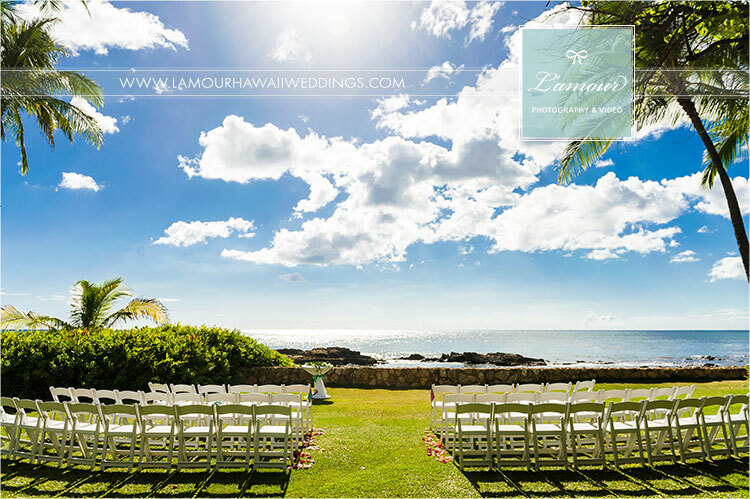 This is the oceanfront Hawaii wedding venue Lanikuhonua found on the West coast of Oahu among the Ko’olina Lagoons. 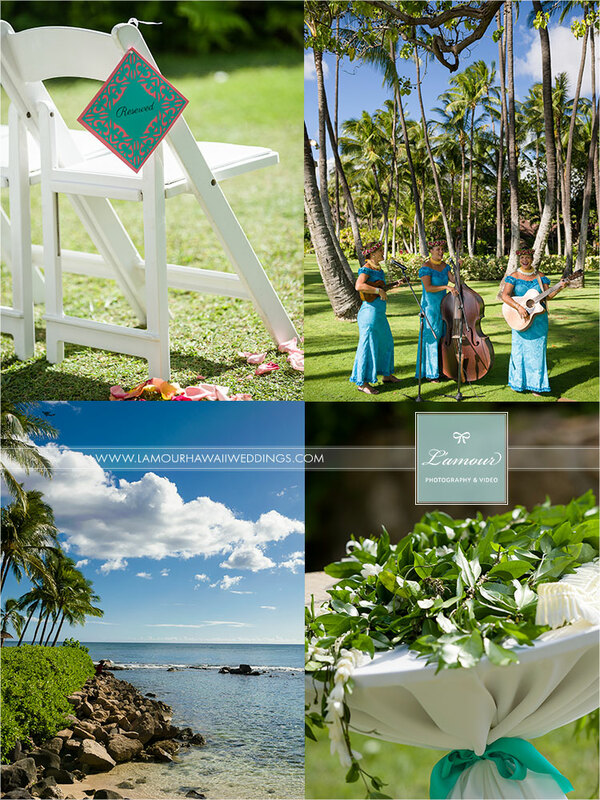 Musicians played and sang traditional Hawaiian music as the guests arrived and were seated. 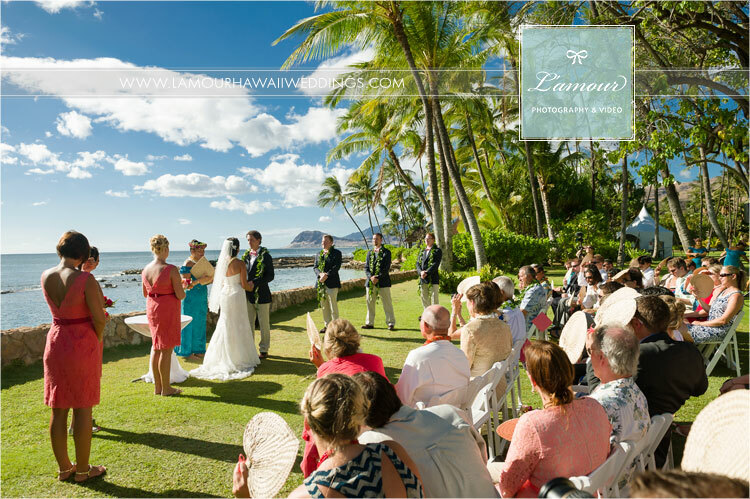 Guests were given woven fans to shade themselves during the ceremony. 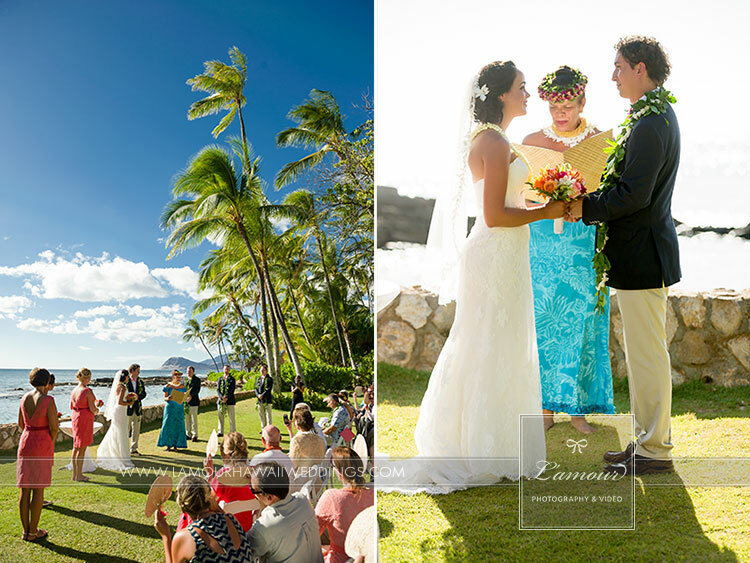 The Bride and Groom stood in front of their closest family and friends as they exchanged leis and their vows with the Pacific Ocean, palm trees and mountain range as a backdrop. 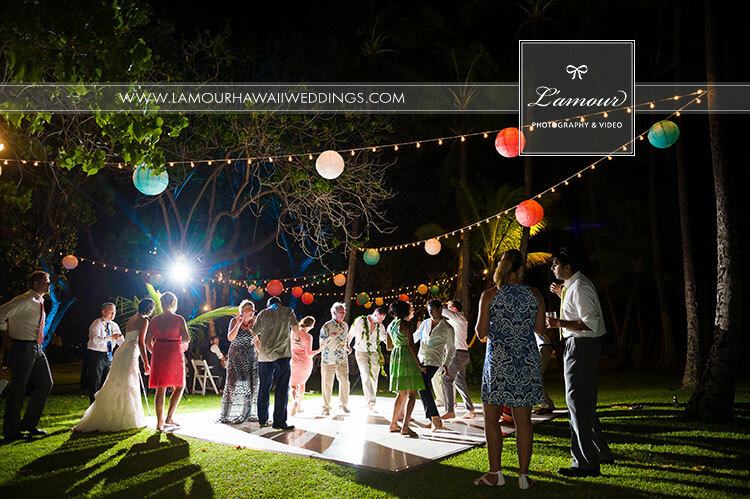 This Oahu wedding reception was adorned with coral and teal paper lanterns and strings of lights. 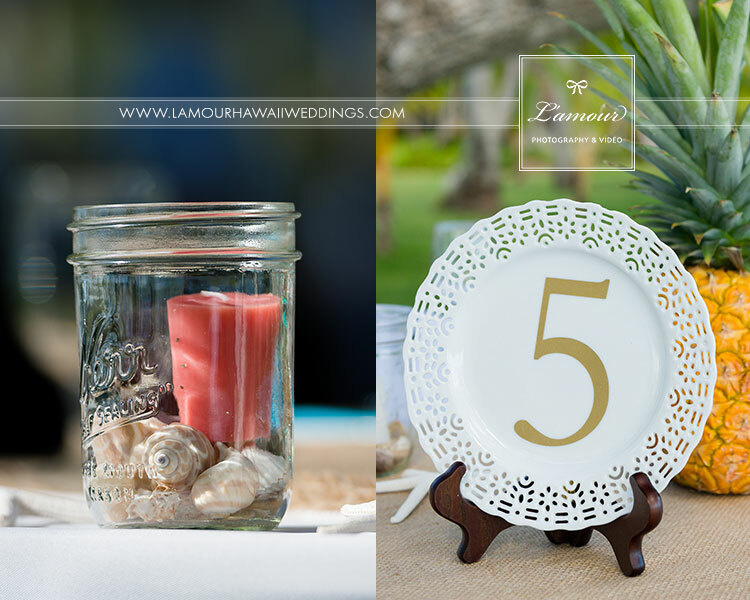 Reception tables featured a real pineapple as the centerpiece, white gold plates as table numbers, as well as mason gars with shells and tea lights on burlap table runners. 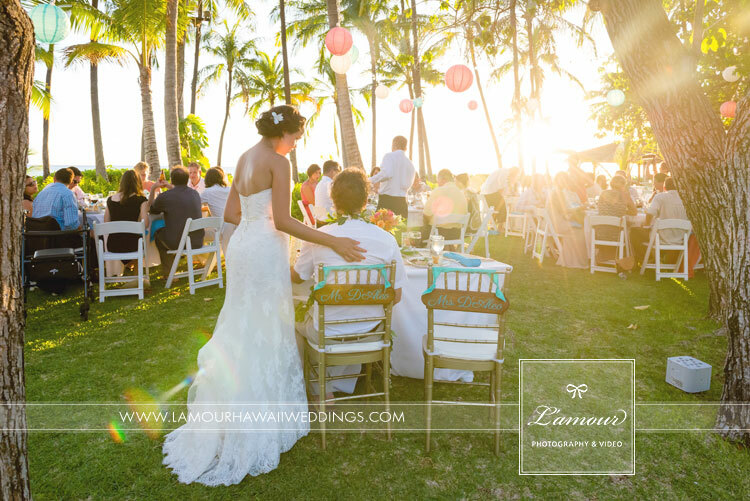 The bride and groom’s chairs had personalized wood signs hanging with “Mr” and “Mrs” written on them. 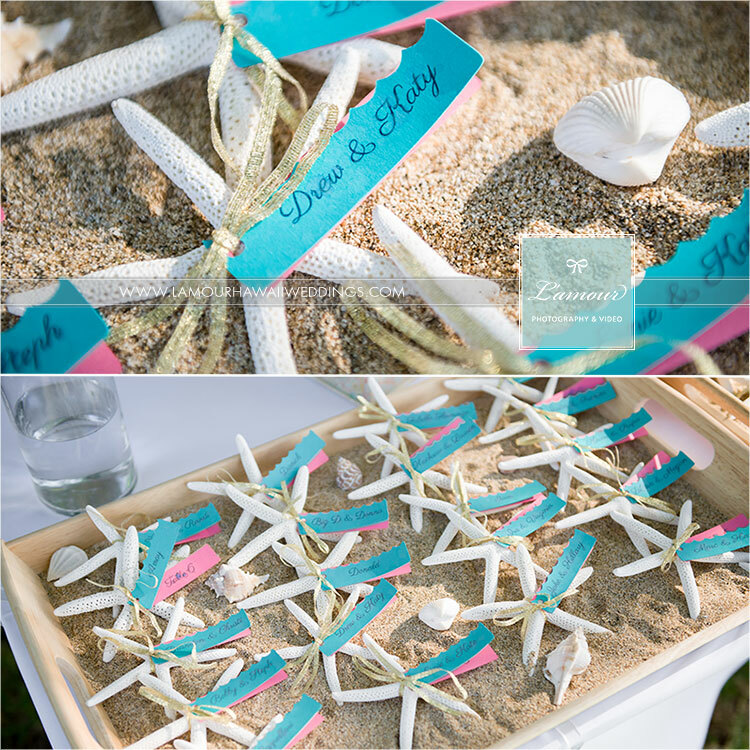 Guests were greeted with seating cards of teal and coral wave shaped tags tied onto starfish. 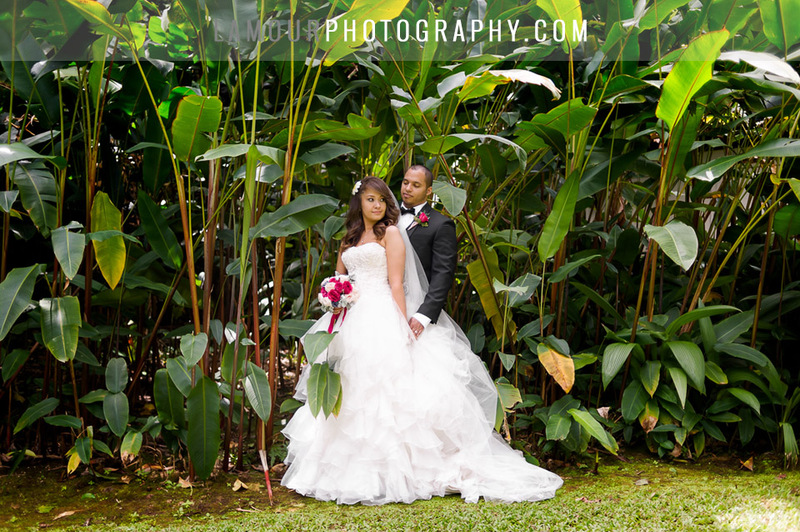 What a cute tropical wedding detail! 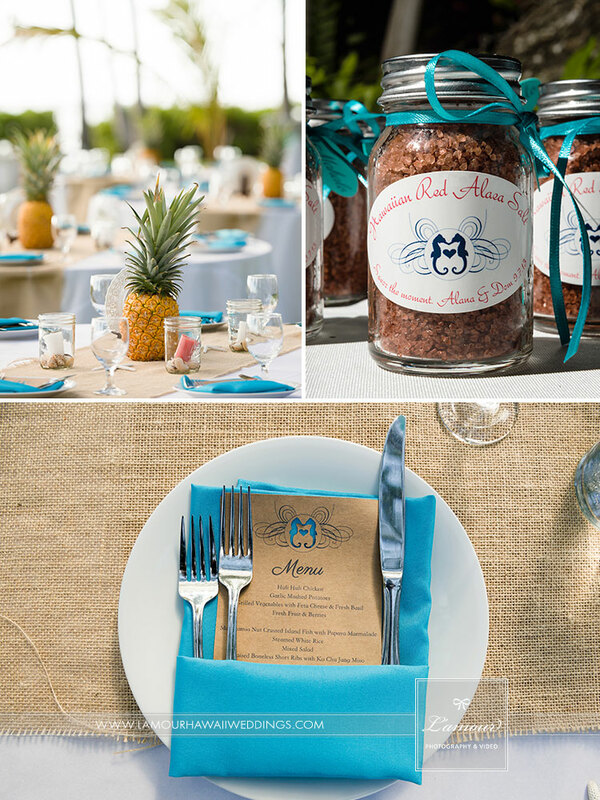 The bride and groom gifted each guest with a mason jar of Hawaiian Res Alaea Salt as the wedding favor. 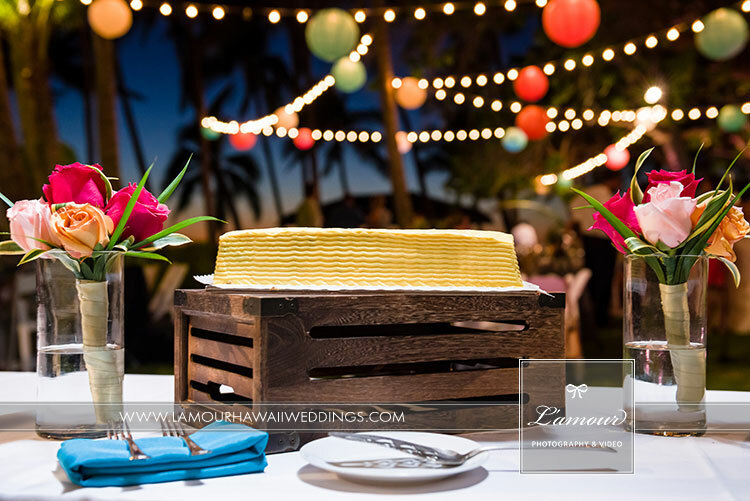 The newlyweds cut their single level square cake with the cutest cake set ever. 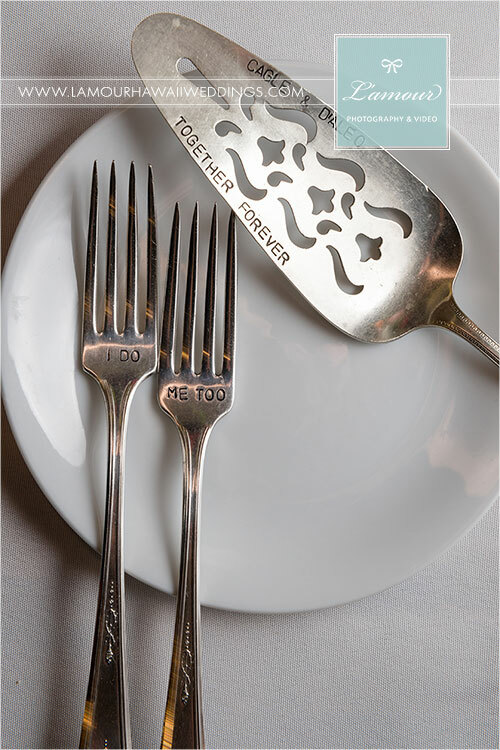 The silver cake cutting set was stamped with their names and “Together Forever” and two forks were stamped with “I Do” and “Me Too.” All of these cute wedding decor details created a fun atmosphere that carried from the ceremony through the reception. 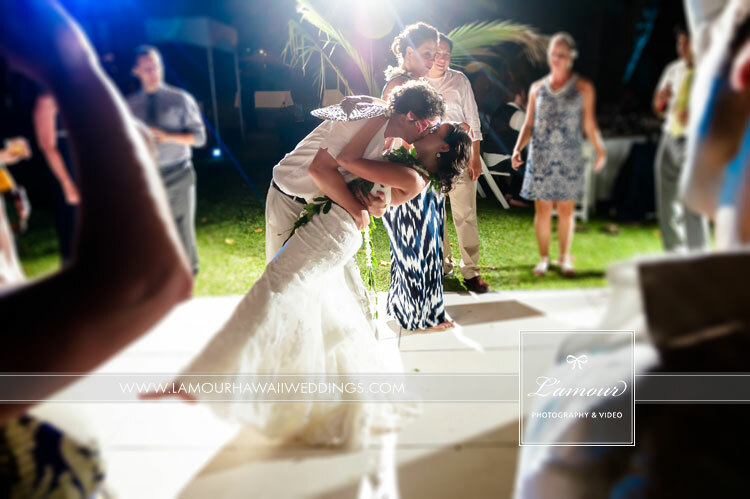 This fun loving bunch danced the night away under the colorful paper lanterns and strings of lights and ended the night with a kiss and a dip!